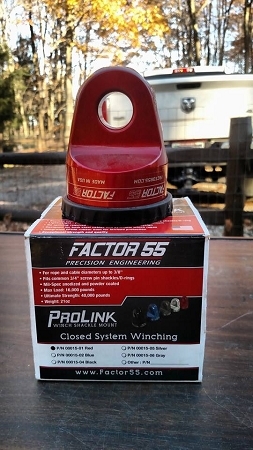 Factor 55 introduces the new ProLink shackle mount for winch cables and synthetic ropes. Engineered and machined in the USA from lightweight billet 6061 aluminum, the ProLink provides a safe means to easily attach a standard 3/4″ screw pin shackle to existing winch cable and rope eyes The cable or rope eye is captured into the body of the ProLink by a removable oversized 5/8″ double shear pin. The front of the ProLink provides the precision shackle mounting hole and massive 1.2″ thick mounting tab. The ProLink is compatible with both Hawse and Roller fairleads and snugs neatly against both versions.